Welcome to GPSWorldTraveler. This site is for us - and the world to share GPS travel experiences. We hope you will not only have fun reading our adventures but be inspired to add a few of your own tall tales. Happy travel. 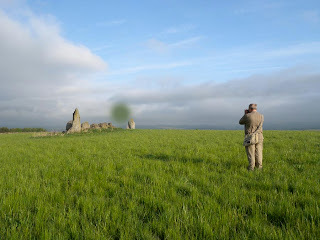 When we stayed with Marion and Kiji in Inverurie, a small village in a small hamlet in Aberdeenshire we were first introduced to Stone Circles. Not having the foggiest idea of what a stone circle really was, we were not prepared for the magic, the history or wonderment we would feel as we wandered throughout the countryside seeking out these amazing treasures. Our first encounter was a glimpse of a 5000 year old Pictish stone circle through the windows of their 17th century stone home. At that moment we were filled with magical wonderment... and through Marion's passion, stories and love we were hooked on stone circles.